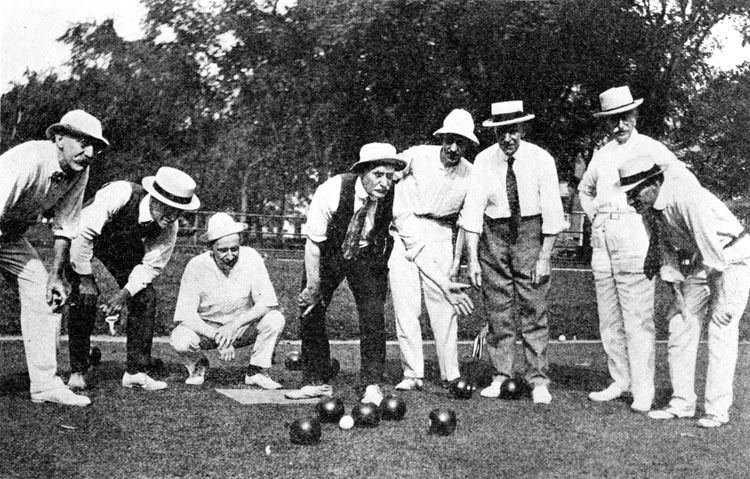 Lawn Bowling, or ‘Bowling on the Green’ has its roots in old England. It has been played since the 13th Century and is very popular in many countries. In those ancient times it was know as the ‘Kings’ game. The Pomona Lawn Bowling Club has been active for more than 76 years. We are part of the Southwest Lawn Bowling Association with 30 active clubs throughout Southern California. There are over a hundred clubs in the United States with over 25,000 men and women participants. Lawn bowling is played with a special bowl (ball) that is contoured & weighted so it will not roll in a straight line. The bowls come in several sizes and weights in various colors and distinctive graphics. White or matching color attire for both ladies and men is required when competing in tournaments or league play. Do not talk to another player or move within there line of vision when they are preparing to deliver their bowl. At the conclusion of each game it is customary to shake hands with all players in your game.